By using a simple visual indicating system, this small transistor tester allows you to run a quick ‘go/non-go’ check on NPN as well as PNP transistors. If the device under test is a working NPN then the green LED (D1) will ﬂash, while the red counterpart will ﬂash for a functional PNP device. However if the transistor is shorted, both LEDs will ﬂash, and an open-circuit device will cause the LEDs to remain off. The circuit is based on just one CD4011B quad NAND gate IC, four passive parts and two LEDs. The fourth gate in the IC is not used and its inputs should be grounded. Alternatively, you may want to connect its inputs and output in parallel with IC1.C to increase its drive power to the transistor test circuit. IC1.A and IC1.B together with R2, R3 and C1 form an oscillator circuit that generates a low-frequency square wave at pin 4. 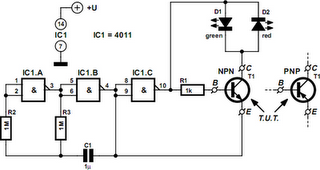 This signal is applied to the emitter of the transistor under test as well as to inverter IC1.C. The inverted signal from IC1.C and the oscillator output then drive the test circuit (LEDs, device under test, R1) in such a away that the voltage across that part of the circuit is effectively reversed all the time. For example, with an NPN transistor under test, when pin 10 is High and pin 4, Low, current ﬂows through LED D1 and the forward biased transistor. However, no current will ﬂow when pins 10 and 4 change states, since the transistor is then reverse-biased. The green LED, D1, will therefore ﬂash at the rate determined by the oscillator. As you would expect to happen, a PNP transistor will be forward biased when pin 10 is Low and 4, High, enabling current to ﬂow through the red LED in that case. A supply rail of around 3 V (two series connected 1.5-V batteries) should be adequate. To prevent damage to the transistor under test, supply voltages higher than 4.5 V should not be used. Because the LED currents are effectively limited to a few mA by the output of IC1.C (also slightly dependent on the supply voltage), it is recommended to use high-efficiency devices for D1 and D2.